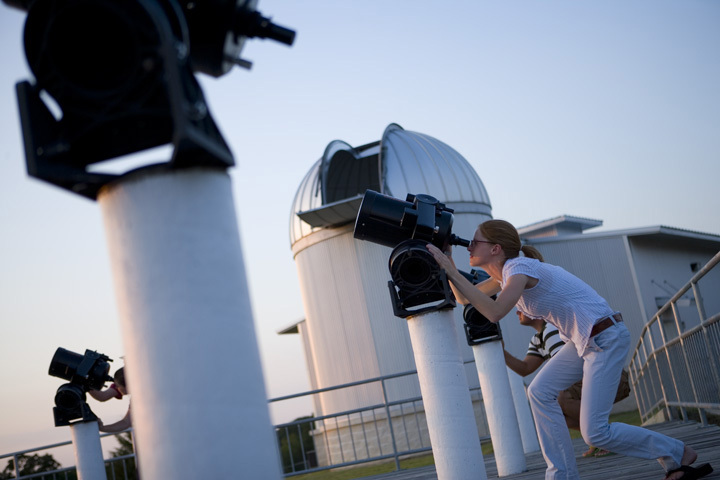 In addition to a world-class astronomy program, Texas A&M University is home to one of the top three college astronomy observatories in the nation, according to the website College Rank. The Texas A&M Physics and Astronomy Teaching Observatory is ranked No. 3 in a recent survey of the 25 Best College Astronomy Observatories by CollegeRank.net, a Michigan-based web entity seeking to “cut through the noise” of online college-related information by highlighting — and, wherever possible, ranking — every aspect of what different colleges have to offer in hopes of giving prospective students a more holistic understanding of their many higher-education options. Since 2005 Carona has served as the first and only manager of the Texas A&M 0bservatory, a key part of the university’s internationally known astronomy program. Under his leadership, the observatory has become a premier teaching resource. The facility features a 60-seat classroom, a 16-inch telescope housed under an 18-foot hydraulically operated dome, a robotic observatory with a 20-inch telescope that can be controlled remotely via the Internet, and a student observing deck that supports 16 telescope piers for 8-inch student telescopes used in various astronomy classes as well as public outreach events.